Hello all! Today I want to share with you a few more amazing Shimmer Polish glitters. I continue to be amazed by these glitters, the composition of glitters as well as the application is really impressive. First the pictures and some brief descriptions, then my overall thoughts on these four at the end! 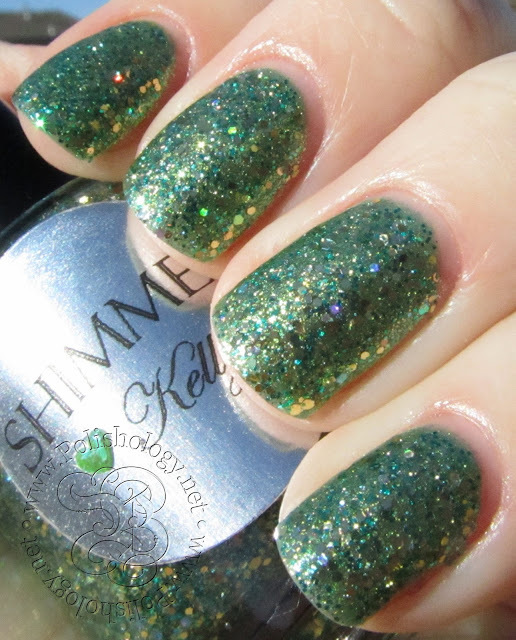 Kelly is a mix of yellow-toned green glitter and gold glitter in a clear base. 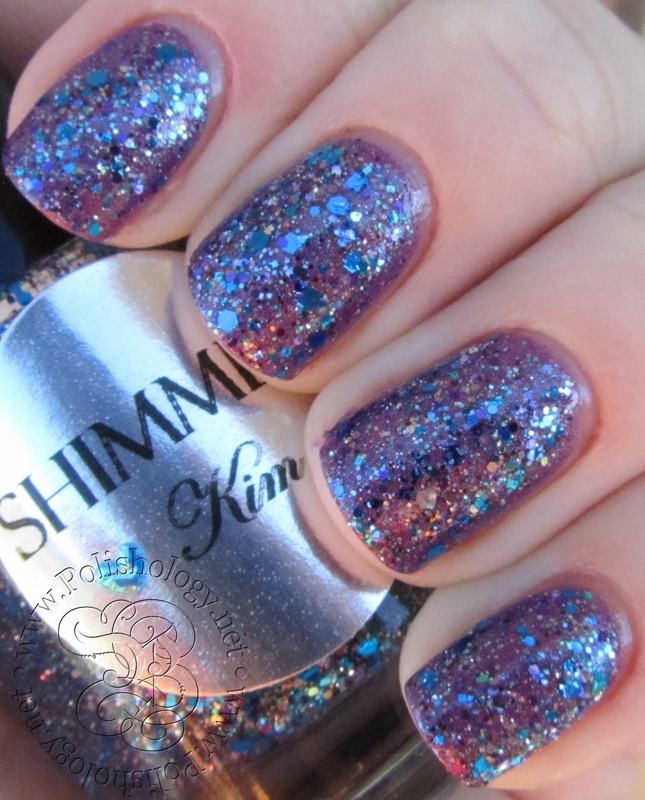 Small holographic glitters sprinkled throughout really add to the sparkle. This is one coat of Kelly over Zoya Apple. 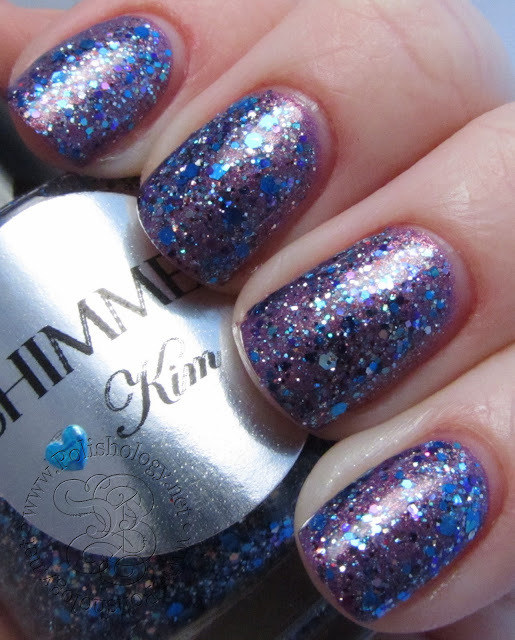 Kim is a unique mix of purple, blue, teal and silver glitters predominantly in a clear base. Glitters here are in various sizes, and some of the silver glitters are holographic. Blue is my favorite color, with purple a close second - so of course, I am totally in love with this one! 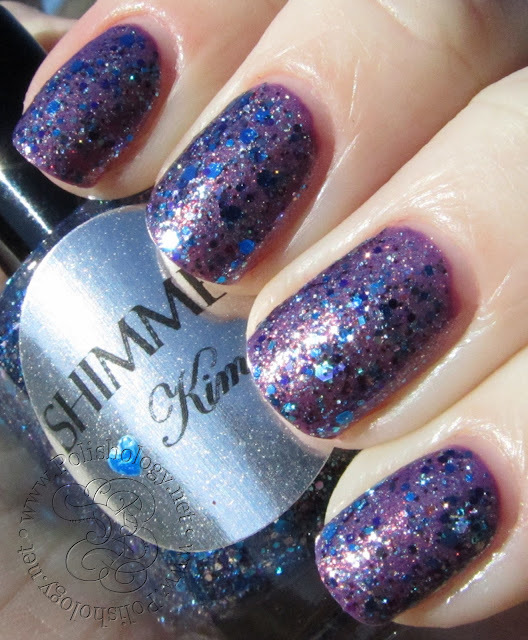 Shown is one coat of Kim over Zoya Danii. 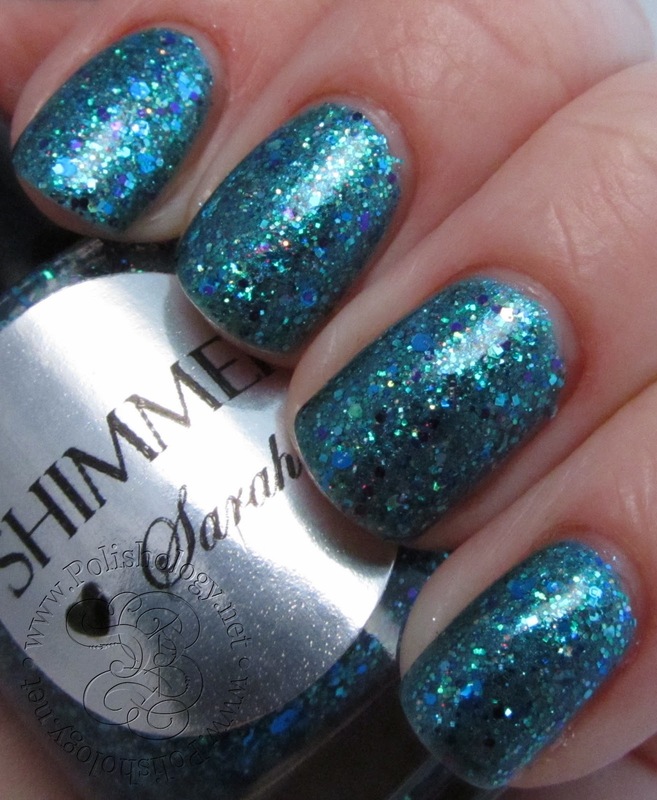 Sarah is predominantly a bright a bold turquoise glitter with some blue, purple, and gold sprinkled throughout in a clear base. I am amazingly in love with this color! While mostly blue the purple adds a unique depth to this one. Shown is one coat of Sarah over OPI Austin-tatious Turquoise. Wendy is an amazing explosion of color - predominantly turquoises, purples, and coppery-oranges but with some other colors mixed in. While the glitters are in a variety of sizes and colors everything goes together very nicely. The colors have an almost muted, vintage hue to them. I love it! 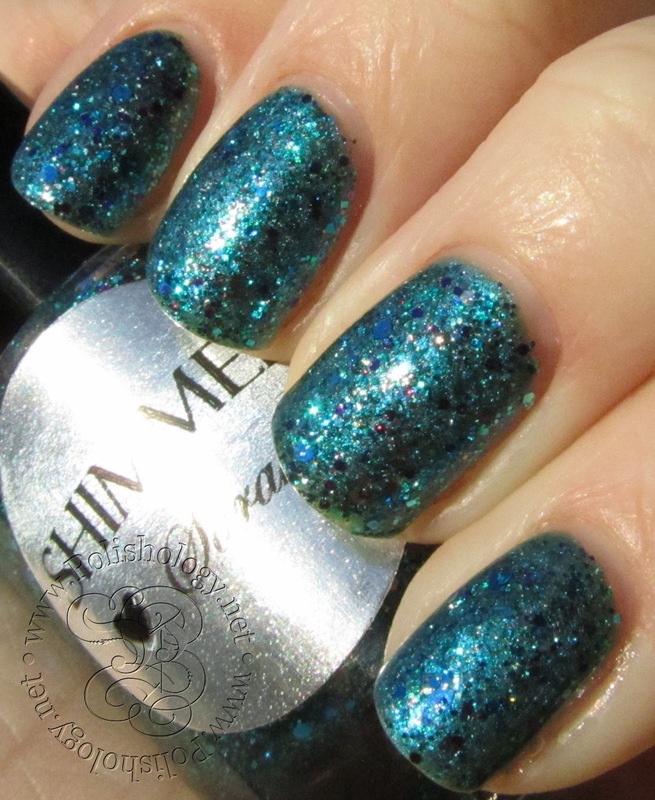 Shown is one coat of Wendy over a England Lady of the Lake. As I said before, I am continually impressed with Shimmer polishes. Cindy really is a genius at glitter combos - to be able to have so many different colors, shapes, and sizes of glitter together without getting a cluttered, thrown-together look takes talent. The combinations are gorgeous, very interesting, and put forward a really cohesive look. Additionally, they apply really nicely (not too thick for glitter-bombs) and the glitter doesn't curl, bleed, or settle. These can all be worn alone in 2-3 coats in addition to being perfect for layering over different colors. Since there are so many colors in these glitters, there are a variety of options for "undies" to highlight different aspects. I would pick a favorite of these four but... I cannot. I pretty much love all of them! 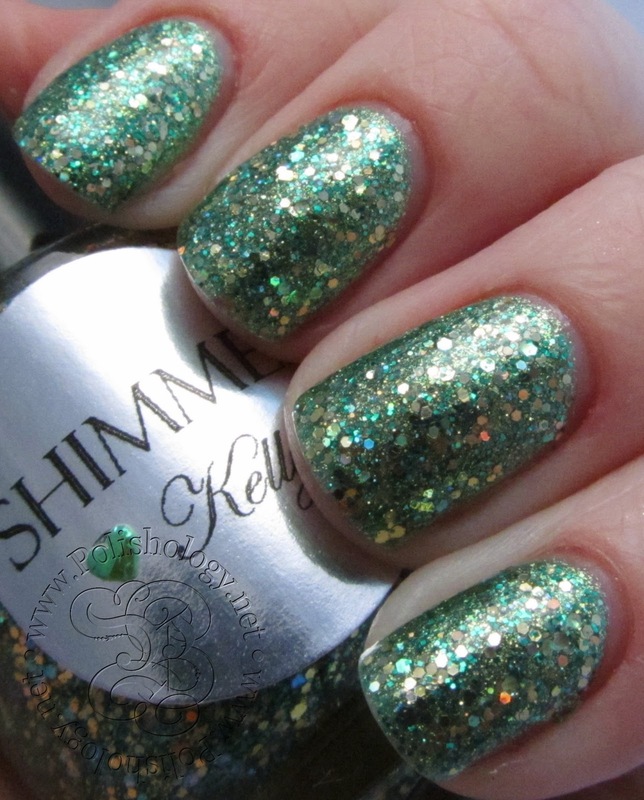 Find Shimmer Polish on Cindy's Blog or Etsy Store! Ooh, these are all very pretty! Love them all, but Wendy is my favorite -- so colorful! So pretty. How could I choose a favorite.